Do you remember last year when I discovered the small black spots on our house and the cause? Well, over the past few months and with the Pres around all the time, we talked about the plan for this year. Deciding that we would be better off to eliminate the source of the "Artillery Fungus," I tackled the two day task head on. The plan was to remove any and all mulch from the front garden beds, relocating it to the plantings along the fence far away from the house. So, once the weather approached the forties, my friends (the rake, the shovel, the five gallon pail, the wheelbarrow and my work gloves) and I hit the dirt. 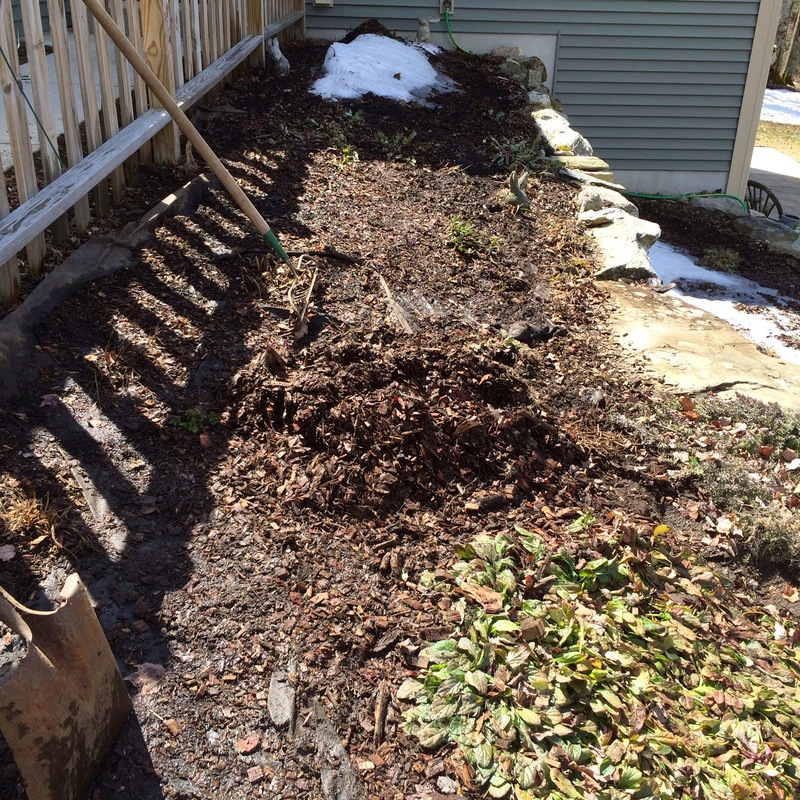 I raked, shoveled, toted buckets all in an effort to eliminate the source. Aside from a few chips here and there, it is all done...both garden beds (upper and lower) as well as the strips along the front walkway. As of now, we think we only want to plant grass on either side of the front walk for a few reasons. If we chose stone, I wouldn't be able to use the snow blower there next Winter. I really don't want flowers along the walk in case people are allergic to bees. So grass seed will be put down in a week or so, then I'll just add a few shepherd hooks for hanging pots. The grass will be easily trimmed with the edger/weed whacker I bought myself last year. In case you aren't familiar with "Artillery Fungus", click on the link near the pix for an eye opening read. i hope the grass fills in nicely for you! i am totally exhausted doing all this reading of all your work.. got to go rest as soon as i publish. i think the grass is a good idea..
Hope your defensive action works for you. I learned something new on that fungus. Hope it works out for you. I have never heard of this fungus. I am glad you were able to take care and eliminate the source.. The grass sounds like a good idea.. This is a new fungus for me and it sounds nasty! I guess if you've decided to sod the area it will eliminate the problem and with all the bees in my gardens I've never thought about anyone being allergic to them. I hope all this work eliminates the problem. MY! You have been very busy! That sounds like entirely too much work. I do remember you talking about that last year though. Goodness, that sounds like a hard thing to tackle. Good luck with it. Let us know if your 'tactics' worked! Lot of work. Hope it doesn't come back. You're lucky you can get out and do these chores already JP. I haven't heard of this fungus before so thanks for the heads up. That was a big job for you to move all your mulch so I hope it works. What a job to move all that mulch. I hope it's the solution for the Artillery Fungus. Nice blog! And a busy time for all of us as spring comes on full force.